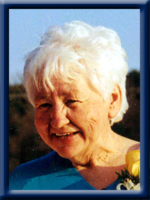 JESSO – Marina C., 72, of Milton, Queens County, passed away peacefully at home on Monday, September 9th, 2013 surrounded by her loving family. Born in Milton, she was a daughter of the late Donald and Marguerite (MacDonald) MacLeod. Marina was a former employee of K&W Bookbinding as well as a counter clerk for Danny Seamone’s Store. She worked at the family business, MacLeod’s Garage, and later MacLeod’s Fuels as a dispatcher. She loved her family and will be sadly missed, but lovingly remembered as a soft and loving person who had a strong faith, strong will, was sincere and brave of heart. She is survived by her daughters Belinda (Jeff) Orme of Milton, Rebecca “Becky” (Mark) Lavender of Mill Village, her son John of Brooklyn, her grandchildren Lucas Lavender, Jayme Jesso and Jacob Jesso, Stephanie Wilson and Caitlin and Ally Wilson as well as her sisters Barbara McLeod of Charleston and Ruth (Robert) MacDonald of Milton, her brother Reginald of Brooklyn. She was predeceased by a sister in infancy and her brothers Phillip and Richard. Belinda, Becky, John and family, I am so sorry to hear about your mom passing away, she was a sweet person and you will all have lots of good memories of her, thoughts are with you all at this sad time. I was so shocked to hear of your dear mothers passing.She was my friend for years..a great person.She is pain free..Thinks of you all at this very difficult time. I was so deeply saddened to hear about your Mom’s passing. Please know that you are all in my thoughts and prayers at this most difficult time. Take care and may God Bless. I am so sorry to hear of Marina’s passing.May she rest in Peace. Dear Belinda and Family, We are so sorry for your loss. Our thoughts and prayers are with you at this difficult time. Belinda, John and Becky so sorry to hear about your moms passing. Thinking of you all at this sad and difficult time. Treasure your memories and keep them in your heart. She will never be forgotten and always remembered rest in piece. Words are inadequate at a time like this, but I’m so sorry for your loss. Thinking of you as go through this difficult time. Belinda, John, Becky and families – My heart is broken for you all; I know how much Marina meant to you especially, but also to everyone who was related to her or even was lucky enough to be her friend. She was certainly one of a kind and will be missed by all. I will miss her regular check in to make sure I was feeling okay. She will always be with you, as long as she is in your heart. (((HUGS))). I was so shocked to hear of Marina’s passing. I have many wonderful memories as child spending time at her home. She was truly a wonderful lady. My deepest sympathy to you all. so sorry to hear of your mom,s passing . we are very sorry for your loss. we are thinking of you all at this time. sending deepest sympathies. Belinda & Family ,so sorry for your loss .Marina was a lovely lady .I know how wonderful you were to your mom ,you always have these wonderful times to remember .Thinking of you . Belinda, John and Becky so sorry to hear about your moms passing. Our thoughts and our prayers are with your family. Belinda,John,and Becky ,so sorry for your loss of your mom our thoughts and prayers are with you all. So sorry for the loss of Marina. She loved and was loved. She was a gentle and friendly lady. We feel privileged to have know her. Sorry to hear of your moms passing, she was a lovely lady who always had a smile for all who knew her. Our thoughts and prayers are with you at this sad time. We are so sorry to hear of your loss. We know how much Marina meant to each of you. Our thoughts are with you. Your Mom was the sweetest lady , growing up in Milton,I’ve always known her., ..Ron and I are so sorry for your loss . As we have each experienced a loss of a parent, .the memories are always in your hearts forever , and she left lots of good memories that I’m am sure of …love and hugs to all of you …our sincere heartfelt sympathy .. SORRY TO HEAR OF YOUR LOSS . YOUR MOM WAS A VERY KIND LADY AND LOVED BY HER FAMILY . YOU WERE ALL VERY SUPPORTIVE TO HER . HER PAIN IS OVER . SINCERELY BRENDA LAWRENCE . Belinda, Becky and John we are sorry to hear of your loss I am sure this is a sad time. We are thinking of you. to the JESSO family, belinda,becky and john. we are so very sorry to hear of your moms passing. we grew up together and were friends for many years. please know that our thoughts and prayers are with you at this difficult time. you will all get to share the wonderful memories of the times growing up. Thinking of all of you, it is hard losing a loved one. Marina was a strong women and will be missed by all. Remember the good times, God bless all. We were so saddened to hear of your Mom’s passing,she was a lovely person and a pleasure to have known.our condolences to you all at this very sad time. Becky,Belinda,John & families.So sad to hear of your Mom’s passing.Marina always had a smile on her face & a kind word for everyone.She will now smile down on her family & friends. She will be missed. In my thoughts & prayers. I had the privilege of seeing Marina in “the office” over many years, and will miss her sweet smile. Brave of heart – what a wonderful description. Condolences to all of you. You will miss your Mom terribly, but remembrances will hold you through. Becky, Lucas, Stephanie, Caitlin, Ally, Barb and famiy. I are sorry to hear of your great loss. My condolences to all of you. Becky and family….I am saddened to hear of your loss. My prayers and thoughts are with you. Ruth and Bob and all the family, sorry to hear of your loss. Our hearts go out to all of you. Marina was not only my cousin, she was a good friend. Always a smile and never a harsh word towards anyone. Hold on to the knowledge that she loved the three of you very much…. My condolences to all of Marina’s family.Your description of her is exactly how she was perceived by those she met- soft spoken and loving. I was so Saddened to hear of your Mom’s passing, What a Beautiful And Sweet person she was. I alway’s looked forward to seeing your Mom come into Sobey’s so That I could wait on her, I alway’s enjoyed our talks together. I’ve known your Mom for a long time with me being from Milton also and going to her Father’s garage. She was alway’s so Pleasant and Friendly. But most of all the Love she had for her Family was outstanding. Keep the Love she showed you all close to your Heart. She’s had a Long Struggle but now is Free from All her pain. May God Bless you all at this most difficult time in your lives,and may Marina now REST IN PEACE!!! Belinda, Becky & John :: We are so sorry for your recent loss. i t is a very difficult time for everyone. let your happy memories be a comfort to you .God bless you !!! I am so sorry to her of Marine passing. We are so sorry. So sorry to hear about your mom, you are all in our thoughts as you go through this difficult time.Remember the love she had for you and all the fond memories you have of her. May she rest in peace. plant in my yard to hear her voice one more time. To her children and grandchildren, I love every last one of them and when I see their faces, I will always remember my pal Marina. God love and bless that family. Beautiful video of a beautiful woman. She will be missed forever and never forgotten. She touched so many lives with her kindness and spirit. Sending love and prayers to you all. Becky, Belinda, John and families….So sorry for your loss. Your Mom was a wonderful, strong Lady who will be sadly missed but fondly remembered by all that knew her. Lean on each other and hold on to your precious memories. My heart aches for you. She is now at peace and her smile is shining down on all of you. Belinda & Families,….. So sorry for your loss of your mother. Our thoughts and prayers are with you all. To all the family we are sorry for your loss. To Belinda, John, Becky and Families…We are so sorry for your loss…Keep her memories close at )-(eart and they will bring you comfort in the days ahead…God Bless! Belinda, John and Becky…I am so sorry for your loss, Marina was such a strong force in my life and she will be so missed. My thoughts and prayers go out to the family. Belinda, John and Becky and families, So sorry to hear of your loss. May the memories that you have in your heart keep her close to you forever. Prayers and hugs going out to everyone. My condolences to the entire family. You are in my thoughts and prayers. May time and family ease your heart yet preserve most precious memories of this beautiful soul. May you all find peace through your memories of Marina. She was a joy to know. Our Condolences to you and your family . Your Mom was a sweet person . Michelle and I both send our condolences to the family. I have known Marina through John and Wade MacLeod. Deepest sympathy. Very sad to hear of Marina’s passing. She was such a gentle and pleasant woman. Thinking of you all during this difficult time. To the Family of Marina Jesso, my cousin. I wish to express my deepest sympathies and condolence on the passing of your beautiful, sweet Mother. So kind – so sweet, with such a gentle and caring spirit. May you have strength and peace during this difficult time. Hold dear the wonderful memories you have of her. I am so blessed that she and I connected after so many, many years. I have never forgotten the many weekly visits to the McLeod home. We are honoured and blessed to have know such a beautiful soul and to have been able to spend time with her recently during our trip home from Alberta. We saw that smile and heard that giggle 🙂 Memories we will hold onto forever. Hugs to all of you during this very difficult time. Death leaves a heartache no one can heal, love leaves a memory no one can steal. May you find strength to comfort one another in the days and weeks ahead. Our thoughts and prayers are with you all. Our deepest sympathy. So sorry to hear of Marina’s passing,she was a lovely person and will be missed by everyone.Our deepest sympathy. Our hearts are heavy at this sad time, so sorry to hear of Marina’s passing. We are very thankful for the visit we had only a few short weeks ago, it was so nice to catch up with a cousin so loved. Becky, Belinda, John and families. I am so very, very sorry to hear of your Mom’s passing. Please know that you are in my thoughts and prayers. Becky ,Belinda, John, so very sorry to hear of Marina;s passing. My thought;s and prayers are with you.all. I know words cannot express the sorrow you feel. Hold on to the memories for they are so dear ; only time can ease the pain. I am so sorry to hear of your mother’s passing. She was such a sweet and wonderful lady, I will always have fond memories of her. Thoughts are will you. To all of Marina’s loving family, Our hearts go out to you all , Marina was such a strong woman a beautiful woman who’s Love will never be gone from your hearts and minds. Keep strong with your fond memories.